Patient-specific instrumentation is a promising technology which has the potential to benefit the hospital, the surgeon, and, most importantly, the patient. 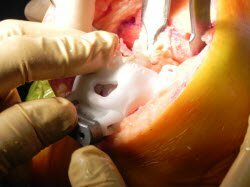 Critical to the longevity of an implant is the surgeon’s ability to restore the mechanical axis while balancing the flexion and extension gaps. Most surgeons accomplish this goal through a combination of measured resection and gap-balancing techniques, with the assistance of intramedullary and extramedullary guides. Experience has shown that an optimal window exists with respect to the mechanical axis, and that “outliers” are prone to fail at an accelerated rate . Additionally, better alignment is correlated with faster rehabilitation and better outcomes [2,3]. In an effort to limit the number of outliers, patient-specific instrumentation was developed. Using preoperative CT or MRI imaging to determine each particular patient’s mechanical axis, patient-specific instrumentation aims to improve the predictability and ease of component insertion. This technique has been shown to improve alignment and assist in component sizing [4-8] while providing the added benefits of decreased operative time, quicker turnover between operative cases, and fewer trays to sterilize and maintain in inventory [5,9-11]. Once a patient has been evaluated and determined to be a candidate for TKA, a preoperative MRI or CT scan is obtained, depending on the particular patient-specific system and the surgeon’s preferences. This scan will provide detailed imaging of the knee, as well as minimal imaging of the hip and ankle, to determine the mechanical axis of the lower extremity. The images are analyzed by a computer to create a three-dimensional model of the patient’s knee. If MRI is used for preoperative imaging, the model will recreate both bone and cartilage landmarks of the knee; if CT is used, only bone landmarks will be recreated. Once the computerized model is created, appropriate component sizes are automatically selected and positioned within the model. 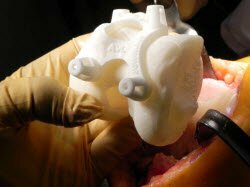 The program will simulate the bone cuts required to implant the recommended components. 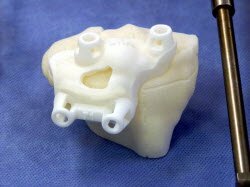 A guide is then designed to fit the model, with pre-made holes to set the drill pins, which will determine placement of cutting guides for bone resection at the time of the operation. Guides and bone models vary according to manufacturer. The senior author of this article utilizes the Signature system (Biomet, Warsaw, Indiana). The mechanical axis, transepicondylar axis, AP axis, posterior condylar axis, and tibial shaft axis can be determined from the preoperative CT or MRI. Based on surgeon preference, the guide will reference the corresponding axes to determine the necessary pin placements for the desired cuts. 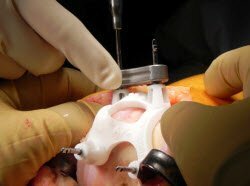 Preoperatively, the surgeon will evaluate the computerized three-dimensional model to confirm the correct levels of resection and component sizing; he or she can make changes to the plan at this time. 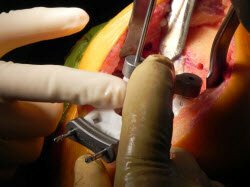 The surgeon can also modify femoral component flexion or rotation, inspect for femoral notching, select the appropriate tibial slope, and alter any other parameter as he or she chooses. 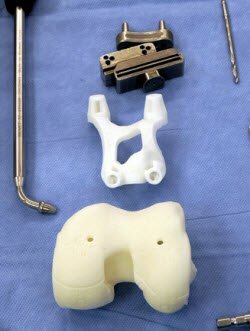 Once the plan in confirmed, actual three-dimensional models of the proximal femur and distal tibia, as well as the corresponding guides, are created through rapid prototyping technology. They are sterilized and then delivered to the operating suite. 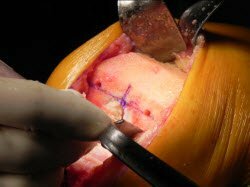 At the time of surgery, the articular surfaces are exposed in standard fashion using a midline incision and median parapatellar arthrotomy. 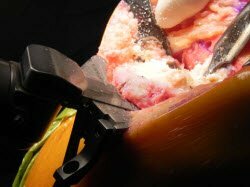 It is important to avoid removing any osteophytes at this point, as they are necessary for proper placement of the patient-specific instrumentation. Attention is turned first to the distal femur. Once the models and guides have been examined to verify that they belong to the correct patient, the femoral model and guide are brought to the operative field (Figure 1). Besides demonstrating the proper fit of the guide on the distal femur (Figures 2-3), the model may be marked with anatomic landmarks, rotational axes, depths and levels of resection. This provides a convenient reference during the procedure. Figure 1. 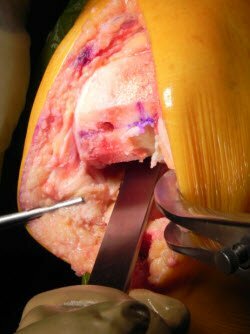 Femoral model, patient-specific guide, and cutting guides. Figure 2. 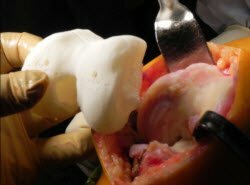 Femoral model is compared to patient’s native anatomy. Figure 3. Femoral guide is placed on the femoral model. The femoral guide is then placed on the distal femur in accordance with predetermined anatomic landmarks, with care taken to ensure proper fit (Figure 4). The position of the guide on the distal femur should match its position on the model. If an MRI-based system is being used, the surgeon should ensure that no gaps or voids exist between the guide and the distal femur. However, if CT was utilized for preoperative imaging, the guide depends on bony rather than soft tissue landmarks, and will rest on key bony elements while not sitting completely flush on the cartilage. Figure 4. 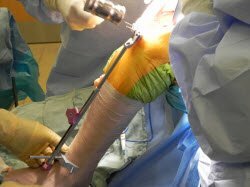 Femoral guide is applied to the distal femur, with care taken to ensure an appropriate fit. The femoral guide has holes to place four pins: Two distal holes at the end of the guide that will be used to orient the 4-in-1 cutting guide and two anterior holes that will be used to place the guide for the distal femoral resection. Once the guide has been fitted to the distal femur, lock the guide in place using the distal pin holes (Figure 5). The rotation of the femoral component has just been established. Next, drill the two holes for distal femoral resection, setting the varus-valgus angle (Figure 6). Figure 5. Distal guide pins are drilled using the femoral guide. Figure 6. Anterior guide pins are drilled using the femoral guide. Depending on the particular patient-specific system, the surgeon may then proceed immediately with distal femoral resection using the guide provided, or remove the distal pins and replace the patient-specific guide with a standard distal femoral cutting guide (Figure 7). To aid in identification of the distal guide holes following distal femoral resection, methylene blue may be applied to the holes, or a surgical marker tip removed from its handle may be used to mark the inside of the guide holes (Figure 8). 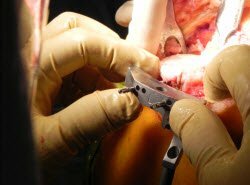 The distal femoral resection is then performed (Figure 9), making sure to achieve a flush, symmetrical cut medially and laterally. The depth of bone resected can be measured and compared with the preoperative plan (Figure 10). Figure 7. The distal guide pins and femoral guide have been removed. The distal femoral cutting guide is now being placed using the anterior pins. Figure 8. A surgical marker tip, removed from the plastic handle, is used to mark the distal pin holes for easy localization following the distal femoral resection. Figure 9. Distal femoral resection is made. Figure 10. The depth of the distal femoral resection is measured, and can be compared to the preoperative plan. The anterior pins are then removed, and attention is turned to aligning the drill holes with the 4-in-1 cutting guide. The surgeon may identify the transepicondylar axis to confirm proper positioning of the drill holes (Figure 11). Figure 11. The transepicondylar and AP axes have been identified. These can be compared to the previously drilled pin holes to ensure proper placement of the 4-in-1 cutting guide. The 4-in-1 cutting guide is placed (Figure 12), and the appropriate resections are made: anterior, posterior, and chamfer cuts (Figure 13). Just as the distal femoral resection was measured, so also may the posterior resection be measured and compared with the preoperative plan. Resection of the femur is now complete (Figure 14). Figure 12. The 4-in-1 cutting guide is placed using the distal pin holes. Figure 13. 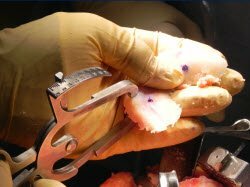 Resections are performed using the 4-in-1 cutting guide. Figure 14. Femoral resection is now complete. Preparation of the tibia proceeds in a similar fashion to that of the femur. The tibial model is marked with relevant axes, anatomic landmarks, depths and levels of resection, and crosshatching to demonstrate proper seating of the guide on the proximal tibia. Once the correct patient has been confirmed, the tibial model and guide are brought to the operative field (Figure 15). Figure 15. Tibial model with guide in place. Additional meniscal and soft tissue dissection of the anterior tibia may be required to achieve an intimate fit between the tibial guide and proximal tibia (Figure 16). Once again, do not remove any osteophytes prior to guide placement. Using the provided model as a reference (Figures 17 and 18), the tibial guide is placed on the native tibia (Figure 19). Figure 16. The proximal tibia is exposed, with removal of soft tissue to facilitate guide placement. Figure 17. The tibial model is compared to the patient’s native anatomy. Figure 18. 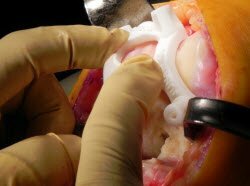 The tibial guide is placed on the tibial model. Figure 19. The tibial guide is placed on the native tibia in the manner demonstrated by the tibial model. Pins are drilled using the holes provided on the tibial guide: two anterior holes to guide resection of the tibial plateau (Figure 20) and two proximal holes to guide rotation of the tibial component (Figure 21). Care is taken to ensure proper positioning of the guide during pin placement. Figure 20. Anterior guide pins are placed. Figure 21. Proximal guide pins are placed. The tibial guide is then either used to perform the proximal tibial resection, or removed along with the proximal rotation pins (Figure 22) and replaced with a standard tibial cutting guide (Figure 23). Visual inspection of the placement of the cutting guide can confirm the proper depth of resection, varus-valgus angle, and desired posterior slope (Figure 24). Proximal tibial resection is performed (Figure 25), and the resection is compared to the preoperative plan. Figure 22. Proximal pins and tibial guide are removed. Figure 23. 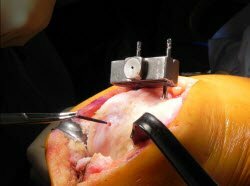 The tibial cutting block is placed using the anterior pins. Figure 24. An extramedullary alignment guide is used to confirm proper placement of cutting block prior to resection. Figure 25. 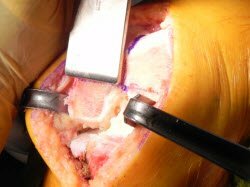 Tibial resection is performed. The previously drilled tibial rotational holes may be used to place a tibial trial plate; an alignment rod can be used to confirm the proper rotation (Figure 26). Preparation for the tibial stem proceeds in the usual fashion. Figure 26. Proper rotation of the tibial component is confirmed using an alignment rod prior to tibial stem preparation. The patella is prepared in standard fashion. 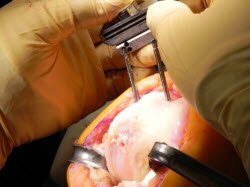 If patellar resurfacing is chosen, the thickness of the patella is measured prior to resection and an appropriately sized prosthesis is placed. 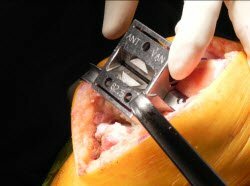 The last important step in preparation of the knee is cleaning out the posterior recess. 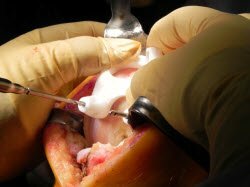 This is accomplished through the use of curettes and/or curved osteotomes to ensure no osteophytes or meniscal remnants exist in the back of the knee (Figure 27). Figure 27. Lamina spreaders are used to expose the posterior recess of the knee. 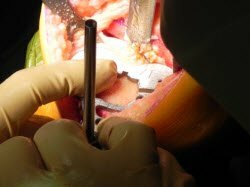 Debris is removed using a curved osteotome or curette. Trial components are placed and the knee is evaluated for range of motion and stability. 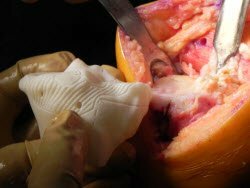 Once the surgeon is satisfied with the result, the final components are placed, the knee is irrigated, and the wound is closed in standard fashion. Carefully reviewing and modifying the computerized plan preoperatively will result in a smoother operation. Always confirm that the guide and model correspond to the patient being operated on. 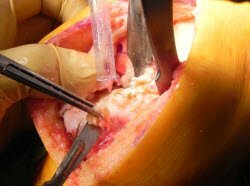 Do not remove osteophytes prior to guide placement, as their presence may be necessary for proper positioning. Care must be taken to ensure the guides fit intimately against the patient’s distal femur and proximal tibia. Improper seating of the guides may result in malalignment. 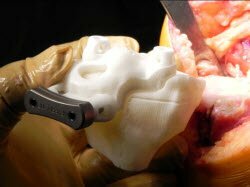 The provided models are useful in predicting how the guides will fit, as well as confirming that appropriate resection has been achieved. 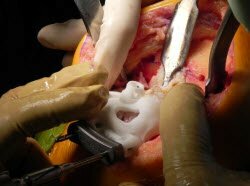 The preoperative plan may be used intraoperatively to identify and ensure removal of all osteophytes underneath the collateral ligaments or in the posterior recess. Patient-specific instrumentation does not take into account ligamentous laxity or other soft tissue considerations; these must be assessed and accounted for intraoperatively. Patient-specific instrumentation has shown great promise in providing consistent placement of components in alignment with the mechanical axis. This technique may allow for shorter operative times, quicker turnover, and improved long-term results. In addition, the reduced number of instrument trays that need to be sterilized and kept in inventory can decrease the costs to the hospital. 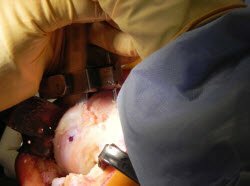 This technique may be especially beneficial in the hands of lower-volume surgeons who are seeking to produce excellent results without the benefit of specialization and high-volume repetition. 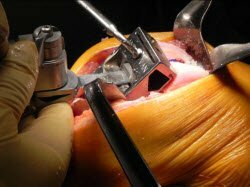 Most importantly, though, patient-specific instrumentation can produce an excellent outcome for the patient, with a well-aligned, high-functioning, and durable TKA. Adolph V. Lombardi, Jr., MD, FACS, and Carl C. Berasi, IV, MD are with Joint Implant Surgeons, Inc., The Ohio State University, Mount Carmel Health System, in New Albany, Ohio.